This is becoming a repeating theme: a nuclear plant operator loses money, announces shutdown; state lawmakers step in to change laws to subsidize the nuclear plant so it can keep operating. 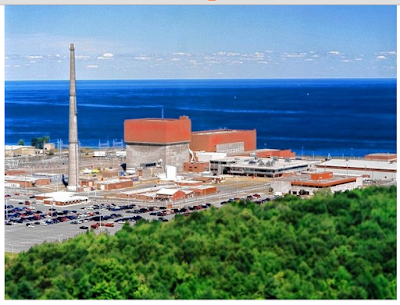 This time around, it is the FitzPatrick nuclear plant, on the shore of Lake Ontario in New York state. see link "CNY state legislators sponsor bills trying to save FitzPatrick nuclear plant"
These new proposed subsidies are in addition to the long list of existing subsidies that US nuclear power plants enjoy. see link to "US Nuclear Plants are Heavily Subsidized," and see link to "Price-Anderson Act Gives Too Much Protection to Nuclear Plants." The FitzPatrick plant is due to shut down in 2017. Lawmakers likely will not garner support for such a subsidy. The simple fact is that a nuclear plant requires substantial investment in its latter years, after age 30 approximately. But, with the low prices for electricity due to increasing natural gas power production, especially at night when the nuclear plant will not or cannot reduce its output, it is difficult for plant owners to justify spending the money on nuclear plant upgrades. FitzPatrick just passed its 40th anniversary (July 1975 startup). Any money spent on upgrades would not have a long life to return the investment. It is better to shut down the plant and cut one's losses, instead of spending money and then shutting it down. Even though many nuclear proponents insist that nuclear plants run for 60 years, that is not the case. When FitzPatrick shuts down in 2017, it will have operated only 42 years. see link to Truth About Nuclear Power - Part 10, "Nuclear plants require costly upgrades after 20 to 30 years"